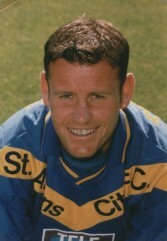 An experienced defender who joined City from Hendon in 1994 and went on to make over 200 appearances. Originally with Spurs, where he made one first-team appearance, Andy also gained further League experience with Gillingham, Cambridge United and Brighton. Moves to Braintree Town and Boreham Wood followed before he joined Ford United in Novemver 2001 and helped the Essex side to win promotion to the Ryman League Premier Division. Moved to Billericay Town in May 2003 to take over as player/assistant-manager.